It looks as though the owners of the Upper Market Street dive bar Lucky 13, which we've long known is endangered, did not intend to do any development work themselves, but now that they've gotten all the necessary entitlements and approvals, they're ready to sell to the highest bidder. 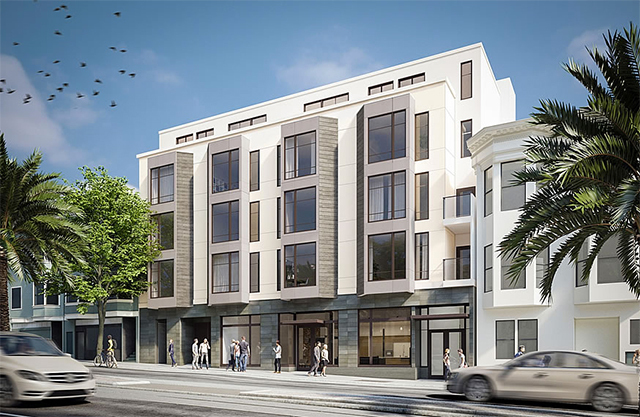 Socketsite finds the news that the building and its land are now listed for $9.75 million, complete with demolition and design approvals for a five-story, 27-unit condo building. It's a curious bit of news only because Brian Spiers, the owner of the building, is a developer himself, so something seems to have happened in recent months to have made him decide to sell off this opportunity to someone else. A demolition notice appeared on the building back in May, upsetting some patrons, and it's been expected for some time that any development here would be stymied by requests for discretionary review related to the building's historical significance  most notably as the place where Harvey Milk celebrated his election victory to the Board of Supervisors, when this was a gay bar called Alfie's, and also as the original building was built for Woodmen of the World, a fraternal organization for woodworkers. Spiers, meanwhile, also owns the former Home restaurant property down at the corner of Church, which is currently under construction as a seven-story condo. And as Hoodline clarifies, Spiers may own the building, but the land beneath the building is under separate ownership, by Frank Cafferkey of Multiventure LLC  and that may better explain why they're selling. Long story short, Lucky 13 is still not long for this world, but there may still need to be some hearings about the historical significance. Drink up while you can.